In paleontology, the term lagerstätten refers to sedimentary deposits having exceptionally well-preserved fossils, especially soft-bodied fossils. Exceptionally preserved fossils can be the result of various geologic processes, including freezing (Siberian permafrost), desiccation (mummified carcasses in desert sands), and resin encasement (amber), just to name a few. 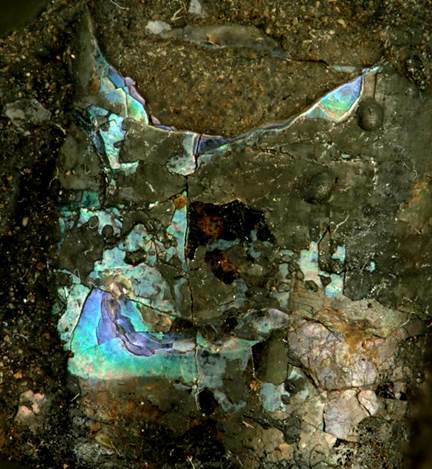 The Buckhorn Lagerstätte of Oklahoma doesn't have soft-bodied fossils, but is remarkable in having aragonitic shelly fossils preserved with the original iridescent, colorful mother-of-pearl (nacre). The Buckhorn dates to the late Middle Pennsylvanian, which makes it - by far - the oldest deposit in the world with aragonitic nacreous shelly fossils. What makes the Buckhorn special? It's an asphalt deposit, that is a paleo-seafloor oil seep deposit. A patch of seafloor in present-day southern Oklahoma was impregnated by heavy oil (asphalt) that seeped out during the Pennsylvanian, well before the sediments were buried or lithified. Modern seafloor seeps of petroleum are known in many places. Normally, the aragonite (CaCO3) and nacre (mother-of-pearl) of shells gets destroyed by recrystallization during diagenesis & post-diagenetic alteration events. 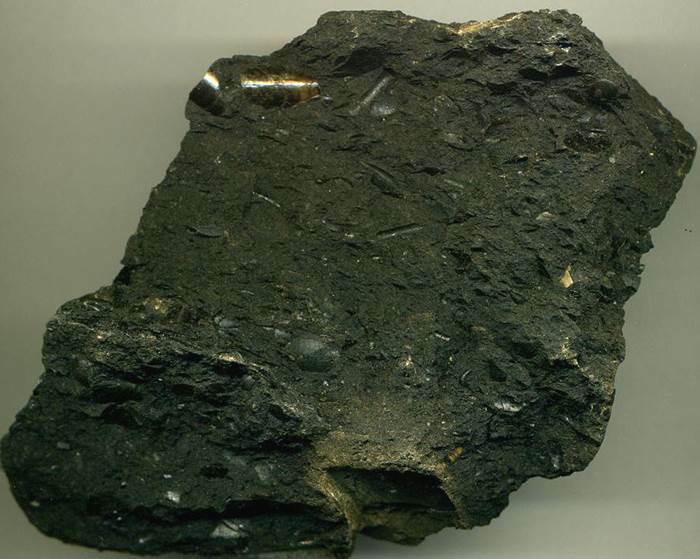 At Buckhorn, the asphalt prevented the nacre from recrystallizing. Age - middle Desmoinesian, upper Middle Pennsylvanian. Locality - Buckhorn Asphalt Quarry, W of Rt. 177, ~10 miles south of Sulphur, southeastern Murray County, Arbuckle Mountains, southern Oklahoma, USA. Buckhorn Asphalt (12 cm across at its widest) - fossiliferous asphaltic limestone with nacreous nautiloid cephalopod shells. The portion of the Pennsylvanian-aged Deese Group that contains the Buckhorn Asphalt is a fine-grained to coarse-grained siliciclastic and carbonate succession of marine rocks having well-preserved molluscs and plant fossils. In the past, the Buckhorn was considered to be shallow-water marine, but it’s been reinterpreted as an offshore, deeper-water deposit. The molluscs in the asphaltic layers are extremely well-preserved (down to the micron level) with the original aragonite and, in many cases, the original iridescent nacre (mother-of-pearl). The mollusc fossils are principally cephalopods, bivalves, and gastropods. Some bellerophontid molluscs are also known from here. The asphaltic interval includes a cephalopod-rich association and a bivalve-gastropod-rich association. Some researchers have been particularly excited by the presence of preserved protoconchs in Buckhorn fossil snails. The protoconch is the most juvenile portion of a snail’s shell, and its morphology has phylogenetic significance. The Buckhorn Asphalt rock samples shown above & below are asphaltic limestones from the cephalopod-rich association. The cephalopod-rich rocks are dominated by fossils of the body chamber portions of the shell (= where the squid hung out). These cephalopod-dominated rocks have been interpreted as submarine mass flow deposits. The sediments making up these flows were already impregnated with petroleum. Buckhorn Asphalt (8.9 cm across at its widest) - fossiliferous asphaltic limestone with nacreous nautiloid cephalopod shells. 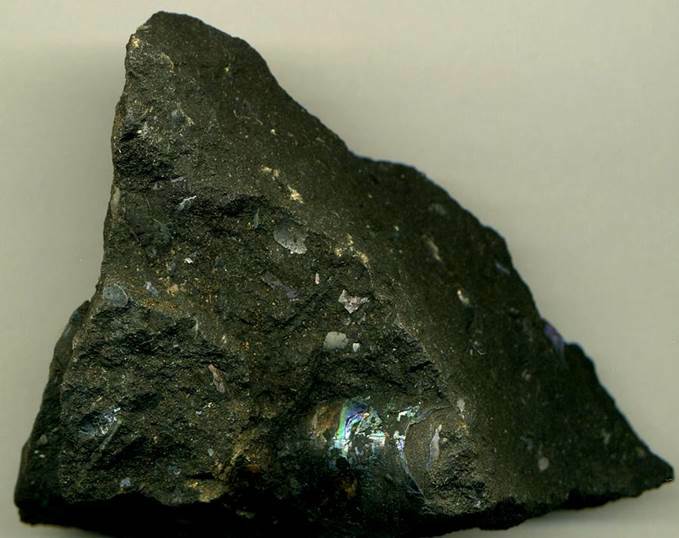 Buckhorn Asphalt (2.4 cm from top to bottom) - nautiloid shell preserved with original iridescent nacre (mother-of-pearl). This deposit has the oldest fossil nacre known anywhere in the world. Mostly synthesized from info. provided by Alex Nutzel and Thomas Yancey.